My mother-in-law stayed with us for the weekend and yesterday we had lunch at an old haunt of mine - Watsons Bay hotel (or Wato Bay as we used to call it). Fresh prawns, beetroot and walnut salad and champagne while sitting in the sun with family. What a relaxing way to spend Sunday afternoon. Hello Sydney, I love you! After lunch we needed to stretch our legs and burn off some of the calories consumed, we walked to Camp Cove and around the South Head Coastal Walk. 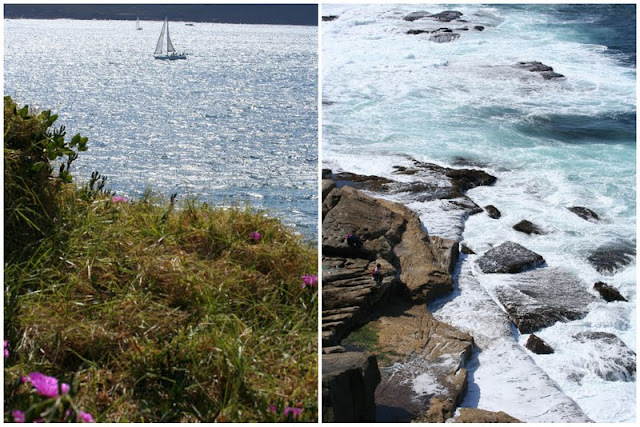 It is such a superb spot for a little photo snapping, sea gazing and exploring. Our kids love to explore on a bushwalk or a track. Exploring is such a good way to keep them entertained. 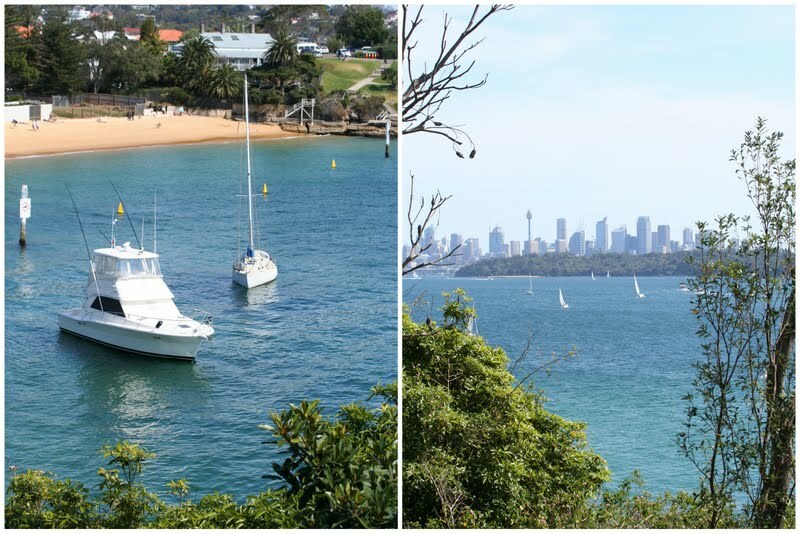 Camp Cove is one of my favourite Sydney harbour beaches. It's tucked away amongst some of Sydney's most beautiful houses and quaint little historic cottages (that still cost a fortune). The water is calm and clear and the views are stunning. My boy stripped off to his undies and was the only person (besides a group of scuba divers rugged up in their wetsuits) to brave the cold water. Wisteria is in full bloom now in Sydney and soon the jacaranda trees will be blossoming also. I love all the pops of purple. I found this lovely wall of wisteria in Camp Cove - the smell was just divine. I did a little vintage treasure hunting on the weekend also and scored a gorgeous 1920's English jug, some tiny silver coffee spoons and a fabulous cabinet that's getting the white paint treatment. Foraging for vintage finds at local markets really makes me happy. What's the best thing you've found lately? have a lovely week, I'll be back soon with some painted furniture to share. beautiful photos. What a lovely spot this is. and I want to go treasure hunting with you next time! i love that walk too! love your jug. the best thing i've found lately.. vintage crates. I love Camp Cove also. What a gorgeous sunny day is was yesterday in Sydney. I love your jug and spoons also. My latest find? I found a great oilskin stool last week on the side of the road. Have a good week, Fiona ...I'm looking forward to seeing more of your amazing furniture. Great photos Fiona, I felt like I was there! I love Doyles, have only been there a couple of times but loved it each time. I love the cute little houses in the bay. Best find lately? I don't know, there are always too many, lol! What a gorgeous afternoon Fiona! Your photos make me want to jump on plane and head down to beautiful Sydney. What a wonderful time, and thanks for inviting us too! 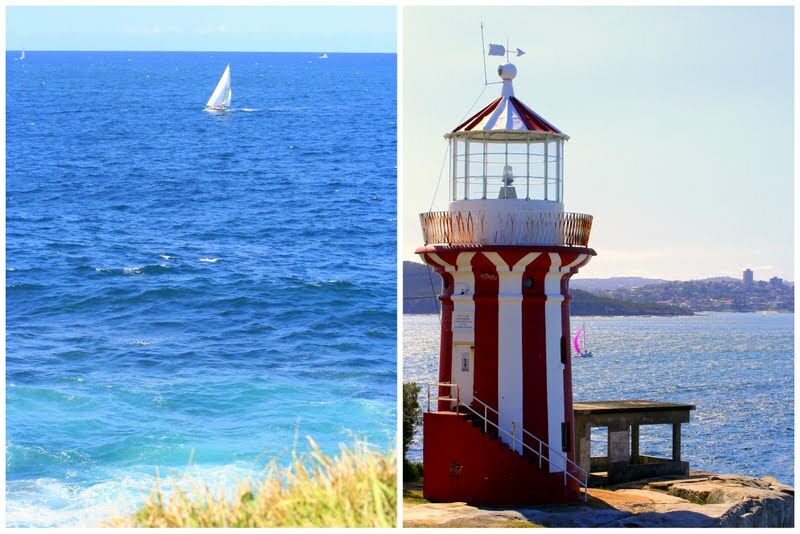 Your photos really capture what sounds like an idylic day! Sydney at it's best! Makes me aware of how lucky we are with where we live! That wisteria is stunning....seeing similar blooms everwhere at the moment. So pretty! hi Fiona, your photos are just stunning of what was obviously a beautiful day. I am loving your blog and your furniture makeovers. thanks so much for sharing. I look forward to seeing the next one. Love your jug! My best find was a vintage wooden ironing board for $5 at our local thrift store. What a beautiful day it is there for you. It's getting much colder here and the days are getting shorter. I love your photos as usual. Just beautiful photography.